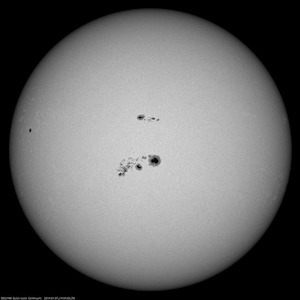 In visible light, sunspots appear as dark patches on the surface of the Sun (Figure 1) because they have lower temperatures than their surroundings, and they are directly linked to intense magnetic activity. The motivation behind today’s paper is that we could learn much more about the magnetic activity of other stars if we could study their starspots in a similar way to sunspots. 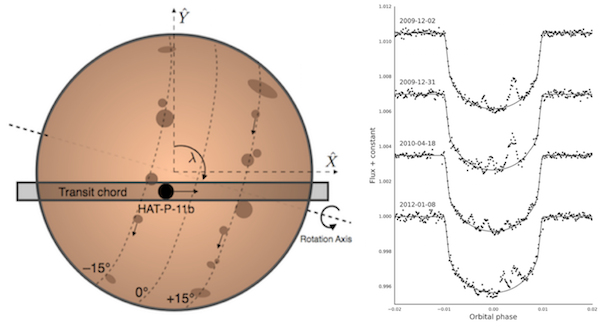 Figure 2:The geometry of the HAT-P-11 system (left) and example transit light curves of HAT-P-11 b (right), observed with Kepler. The bumps visible in the light curves are occultations of starspots by the planet. The exoplanet HAT-P-11 b is a Hot Neptune in orbit around a K4 dwarf star, which is about 80% as massive as the Sun and about 120 light-years distant. HAT-P-11 b was discovered using the transit method, i.e. by detecting a small dip in the flux of the star, caused by the planet passing in front of it and blocking a small fraction of the stellar light (0.004%). However, the observed Kepler light curve shows several bumps occurring during some of these transits (Figure 2, right panel). These anomalies are detections of starspots! When the planet passes over one, it blocks not a bright region, but a dark patch of the star’s surface, so the star briefly appears a little brighter again. In a series of steps, the authors first model the re-occurring transit of the planet and systematically search for any significant flux anomalies. They then estimate additional parameters such as the stellar inclination and the spot contrast, and finally they fit a detailed spot model to the light curves. Due to the geometry of the system and limited measurement precision, there can exist a few plausible spot configurations that describe a particular light curve equally well (Figure 3), but the full set of light curves holds exceptionally detailed information. Figure 3: Left panel: The three hypothetical starspots that are shown would be indistinguishable, since the bumps they produce in the measured light curve are too similar. Middle and right panels: Examples of Kepler light curves and the inferred starspot configurations, plotted on top of each other. Figure 4: Map of starspots detected in the Kepler light curves. The blue and red circles correspond to the spots in the middle and right panels of Figure 3, respectively. The green circle indicates one particularly large spot. The background shading shows the observational coverage of different parts of the stellar surface. Around 30 spots like the ones detected were spread over the entire stellar surface at any point in time between 2009 and 2013.